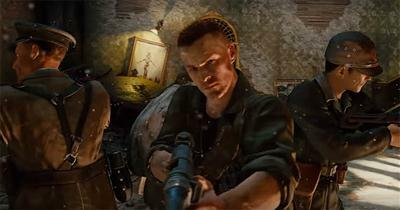 Now that the Black Ops 3 zombies trailer for Gorod Krovi has finally been released we can put most of those zombies rumours to bed and start discussing the facts about DLC 3. So let's examine each of the interesting points from the trailer and I'll give you my opinion on what they translate to both story and gameplay wise. 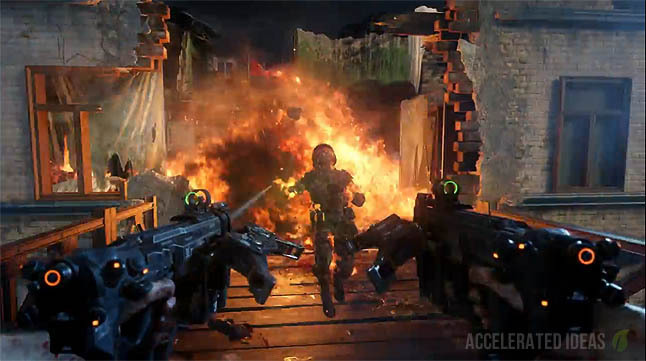 In unusual fashion, the first trailer for Gorod Krovi was actually a complete zombies reveal trailer and included 90 seconds of pure zombies gameplay. That wasn't expected and there will be even more to come when the full intro trailer drops next week. It was clear from the PS4 Theme and the earlier Posters that Gorod Krovi was all about the dragons. We're not talking about a single dragon, or even Game of Thrones dragons...these are BLOPS 3 dragons and there's loads of them in this map. I counted at least five in the promotional image and a huge one in the trailer itself. Down at ground level, the anti-aircraft guns are trying in what appears to be a vain attempt to restrain the dragons or at least fend them off from destroying the city. It's not looking too good through, the city is in ruins with raging fires burning everywhere. 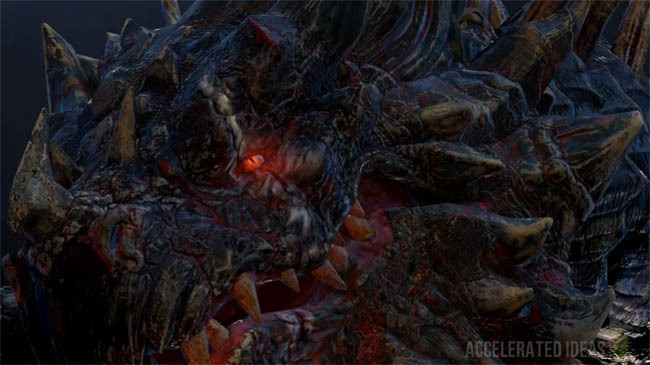 At one point during the video a dragon wipes out an entire group of zombies so it's entirely possible that the dragons will be usable traps or they behave like the contextual robots in Origins. There's also a very small glimpse of what appears to be the players riding a dragon (right at the end of the trailer: 1 min 24 sec). Shown at the 40 second mark. 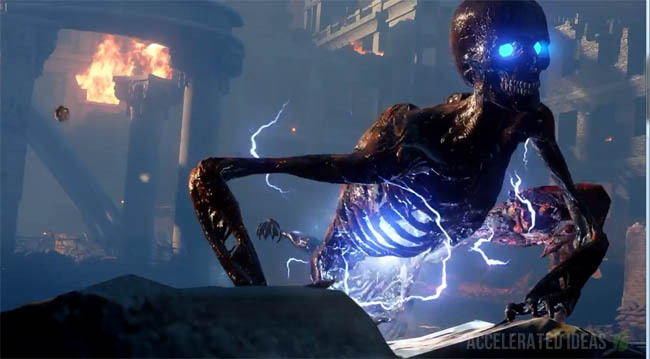 This electric zombie has blue eyes and electric sparks surrounding his body. He appears to crawl out of the ground and hence could be related to the drill site where the underground section of the map is hidden. Keeping with Black Ops 3 tradition, one of the multiplayer weapons will be included in this map and this time it’s the “Shadow Claw”. This compact crossbow was previously only available via Supply Drops but will now come in a dual wield form in Gorod Krovi zombies. The Shadow Claw is usually a one shot killer that fires a single bolt but judging by the trailer the zombie version will have explosive bolts instead, whether it’s upgraded or not. At roughly the 60 second mark, a flying droid appears. It has tentacle like arms, blue lights on it's underbelly and a glowing red beam in the centre of it's body. That's coincidentally very similar to the red ball located on top of the machine that was shown in the original promotional image. Is it controlling them? This is presumably the new "dog round" and that would make perfect sense when you see several of the droids grouping together in the trailer. I imagine they'll behave like the flying creatures from Shadows of Evil; attempting to dodge your attacks, keeping their distance and firing off projectiles. The trusty zombie shield has been remodelled out of dragon bone and upgraded with new abilities in Gorod Krovi. We can clearly see at the 60 second marker that the player looks through the viewport of the shield before launching what appears to be a green gaseous substance that wipes out the nearby zombies with a neat explosion. At the 1 minute 10 mark we get to see a nice collection of box weapons, with some interesting additions by the look of it. The most telling of these is the dual wielded Ray Guns which must surely be the Mark 3 version that we all believed would make its appearance in the third installment of Black Ops. The original Thunder Fists from Origins were an immensely powerful melee weapon that players could unlock through a series of small Easter Egg steps. It looks like they’ll be coming back in some shape or form in Krovi - certainly with a mechanical twist about them this time. Take a look at the 1 min 4 seconds mark and you’ll see the player charging and smashing zombies out of the way with with this new Wonder Weapon. I think it's highly likely that this is a buildable weapon. Having already featured in Origins and Der Eisendrache, the Panzer Soldat makes his return in Gorod Krovi. This time he has a new arsenal that includes what appears to be a laser blaster on his right arm and a hook on his left. No matter what his primary weapons this guy is going to rampage the map in his usual style! "This city....has seen more than its fair share of pain"
"It has been witness to horrors that would make most souls question the very concept of humanity itself." 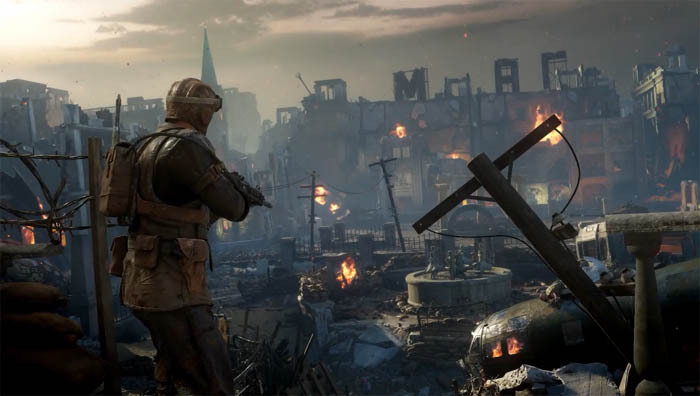 "It has been known by many names but I know it as Stalingrad....city of blood." The full trailer is available on the Call of Duty YouTube channel and has already received a huge number of likes! !